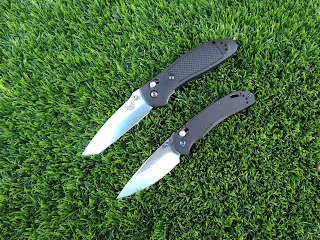 Best Chinese Knives: Benchmade Griptilian 553 Tanto Review + Ganzo Comparison! Benchmade Griptilian 553 Tanto Review + Ganzo Comparison! I got this Griptilian a few weeks ago and am finally ready to do a review on it. The reason I took my time before making this review is because I wanted to get the chance to use this knife and to compare it to the Ganzo Knives competitive options. I'll skip the First Impressions (got the knife used, but not abused). It came to me pretty sharp, but definitely not razor sharp (didn't shave hair from my arm). There are plenty great reviews of this knife, so I would like to focus on my personal impressions and experience with it. The Benchmade Griptilian is a great knife. As of now (after discontinuing the HK branded knives) the most budget offering that features the McHenry Williams designed Axis lock. It is also really well designed and executed. It has no blade play, the Axis lock is really soft and easy to press with only one finger from either side. The ergonomics are awesome and I think the knife will fit most hand sizes. I also really like the gimping on the blade and the "gimping" on the back of the plastic scales, allowing it to be pulled easily from the pocket. Another thing I like about the design is the fact that the tip of the blade is located on the same line as the pivot screw, making it great for controlled cuts. One surprising thing I loved is the sound it makes when opened and closed (the hollow plastic scales are acting like an acoustic guitar's sound box and amplifies the produced sound). The Griptilian is also a truly ambidextrous knife, allowing exactly the same experience for right and left handed users. And finally the action is smooth, especially after I cleaned it, polished the thick bronze washers (took a very nice polish) and tweaked the action. The 553 Griptilian is seriously overpriced (sells for ~$100 MAP - minimum advertised price, so a new knife couldn't be sold for less), especially if you count the materials (plastic scales and 154CM steel). I mean those are OK, but the Spyderco Manix has G10 scales, S30V blade, also made in the US and is sold for roughly the same price. I heard people say that it's because of the quality and the warranty, but lately they had issues with both (even their lifetime sharpening program takes more than a month in the best case), so it is hard to see what you pay your money for. The fit is also a bit lacking - couldn't get that blade to center perfectly without compromising the smooth action. Because of the thick handle it is also substantial in the pocket and take lots of pocket real estate. Finally, the pocket clip is good, but there is something that is hard for me to understand. Benchmade makes great deep carry pocket clips and will gladly send those if you ask kindly. Why don't they include on of those with every Griptilian knife? That could be so much cooler than to ask and wait for the clips after the purchase. I think $100 price tag could cover the cost and save them the shipping costs. So as it could be easily seen that this knife has 2 sides to it. A bit of Knife Philosophy could explain this issue. The knife world is divided by 2: the Users and the Collectors (that rarely understand/agree with each other). The Users could own several knives and the Collectors could use their knives and the difference between them is in the question: Why do they buy their knives? Users buy their knives because they NEED them, Collectors buy theirs because they WANT them. Users usually buy a knife, carry and use it everyday until they brake/lose it and then they'll buy another knife. Collectors buy several knives and do a rotation between those based on their schedule. Users care most about the blade steel and the ergos, Collectors also care about things like blade centering, smooth action and handle materials. Users tend to abuse their knives, Collectors usually don't. So the thing is - this knife is intended for the Users and not the Collectors. The first will appreciate it's working qualities, the Collectors will probably like the G10 version more (or the 940 for that matter, that has better materials). That's my opinion about it and I ask you to share yours in the comments. 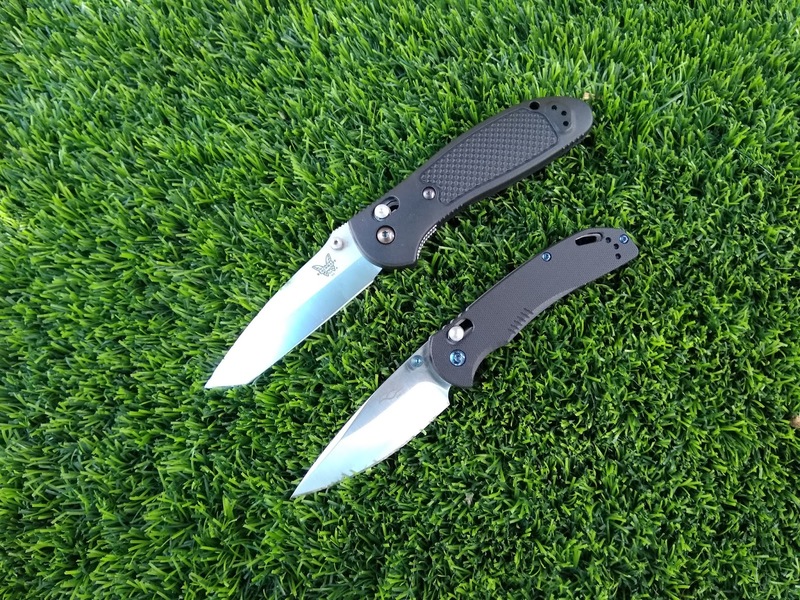 How does the Benchmade 553 compare to the average Ganzo? The better qualities are - the superior steel (154CM vs Ganzo's 440C), the Axis lock vs the G-lock function (is softer), the washers are bigger and take a polish better, the pocket clip and arguably the design and the ergos (depends on the Ganzo model, the hand size and the preferences). The lesser qualities (especially in comparison to the newer Ganzo models): the handle material (I like Ganzo G10 more than the plastic scales on the Grip), the fit (blade centering) and of course the price. Is it a better knife (overall)? Probably. Does it hold better value (price-wise)? Probably not.